These are photographs of Frank Robl, known throughout the country as the "duck man". He was an active bird bander for more than 50 years. His farm located three miles north of Ellinwood is five miles southeast of the Cheyenne Bottoms marsh. 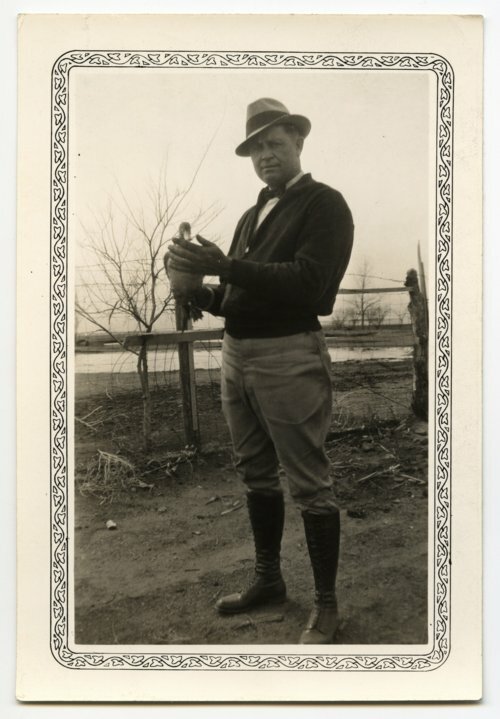 Robl's bird banding began in 1923 and he was most active from 1924 through 1939. During this period, about 18,842 birds were banded and more than 16,000 of these were ducks. This early banding contributed much to our knowledge of the varying migration patterns, longevity, survival and general life history of our many species of ducks. Robl was also an avid photographer and made early movies of waterfowl.